My sister still calls me Binnie, you know. There are 8 bears in my cellar. And this site is called little.red.boat. What do these facts have in common? Many have heard the story of my boat, so I won’t tell it again, (it’s here, though, just in case). But to summarise – I had a boat, it always sank, I called it Sinky. 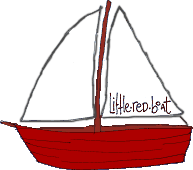 New boats where tentatively suggested, and dismissed out of hand, because I loved my little red sinky, even if it sank. Or perhaps because it sank. I’m not sure. My sinky. Binnie, was my doll. Or one of my dolls. But not bought for me. And not a pleaded or tantrummed for peace offering in a busy shop. Or even yet another hand-me-down, from siblings, or older kids at my dad’s church. No no, I have my pride. It was my doll, and I found it my very own self. Sitting next to a bin. Or on a skip. Or something. And so I called her Binnie. Naturally. I saw her, I found her, and I would not leave the side of that bin without taking her home. My mother bleached that damned doll five times, washed it solidly for two days before she would hand it over. She had ‘eyes-that-close’, like all the fancy dolls on the adverts. Except she’d been through a hard time, and the eye-closing mechanism had suffered. When you laid Binnie on her back, she’d wink at you like a cheap whore. Once, we were given two dolls for Christmas. While my sister called her rag doll a saucy ‘Marie’, a name that conjured up spring evenings on the Champs Elysee, red dresses and fine wine, mine was called Rachel. Because the woman who gave them to us was called Rachel. My teddy bear was called Bear. And then there was another teddy bear, called Teddy. He often kept company with Ted. And then there was another bear, called Big Bear. Little Bear was the same, if slightly smaller. And Pink Bear. Man, I loved Pink Bear. In an act of charity I gave him away to a school fete. Then cried for two days and bought him back with my pocket money as soon as the doors opened. There was a bear I was given free on Lufthansa. He was called Lufty. At present, I have two much newer teddy bears, just hanging about the house. One is called Bear. The other bear is called Other Bear. Still, at least they’re kept company by the teddy which (as a child) my Beloved took to bed. It is called BedTed. And the pets? Well, I never really got to name a pet. Which is, looking at the evidence, probably a good thing. I worry for my children. Although I personally consider Child, or Boy, or Small, or Unbelievablypainful to be perfectly acceptable names for children. Hell, if I had more than one, I could just refer to them as ‘Hey! Children’, and wouldn’t have to remember individual names at all. My sister and I were just running down that names of pets. Tango the Rabbit. In the previous family he was with, they called him Houdini. Not an auspicious sign. Debbie, the guinea pig. A pair of gerbils, called, and this is great, Snow White (named by my sister, 7) and Ghengis Khan (by my brother, 9), and then Daley Thomson, a hamster, and Sid Vicious, the hamster that followed Daley. Then some more gerbils. There is debate of the existence of another guinea pig. Cats came later. But, and this is awful, I don’t remember the endless stream of rodents anywhere near as fondly as I remember the stuffed things. A proportion of the stuffed things are still, for example, in my cellar. A proportion of the rodents, however, are not. Not those ones, anyway. Perhaps some new ones. Still. That’s the way it is with childhood pets, sadly. Or the little, temporary, much loved and soon forgotten ones particularly. My mother was telling me on the phone this evening that once, a neighbour stopped to talk to her as she knelt amongst the shrubbery.